Yesterday, Lara and I joined nearly 2000 women and children at Prospect Park in Reading to run the Cancer Research UK Race for Life. Almost a year since I ran my own first 5km race, Lara ran her first. It was tough. Even at 10 o'clock in the morning, the sun was high and the park had very little shade to offer. Our 5 kilometre route took us up and down the park through the fields and up a very steep path indeed. Lara struggled. She went off fast with a smile on her face but my 1 mile she was hot and tired. We walked for most of the middle of the race and Lara needed a lot of convincing to carry on going! We talked about why we were there, and why people had sponsored us to take on such a tricky challenge - to raise money to fund vital research into the causes of, treatment of and prevention of cancer. At about 4km we were able to see the finish line. The promise of a shiny medal, a drink, and a chocolate spurred her on and we ran the final stretch hand-in-hand through the crowds. Despite Lara's reluctance, she finished with a beaming smile as she picked up her medal, knowing that she had beaten her own previous 5k personal best with a race time of 38:42. Lara was really dressed the part for her race in her own "active wear" so that she looked like Mummy! Onlysportsgear.com stock sports and activewear for young and old. 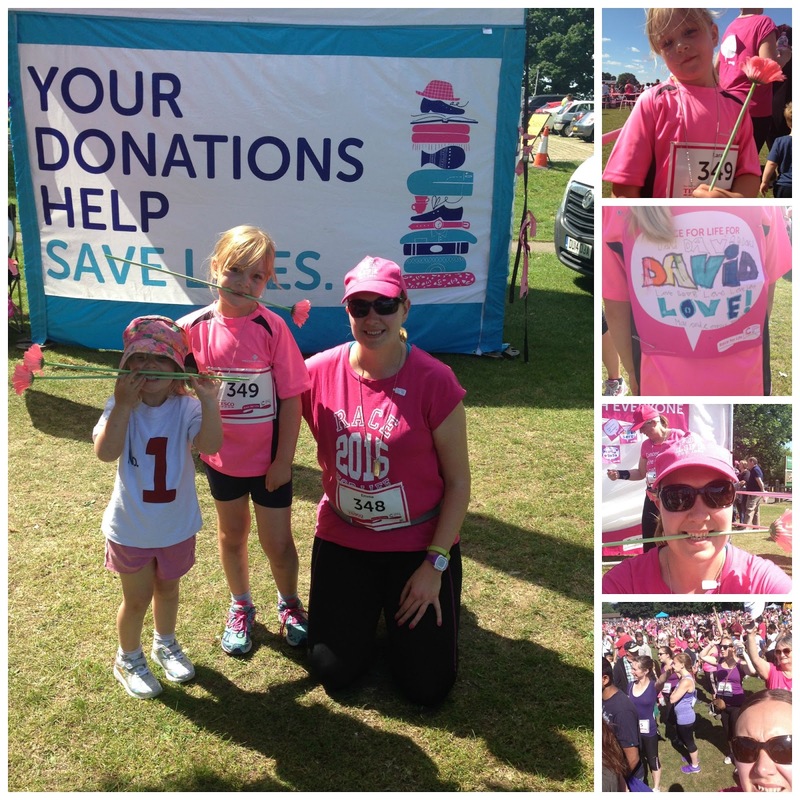 Over the past few months, Lara and I have been collecting sponsors for our Race for Life. This weekend, we smashed our target of £500. When we started, I set a very adventurous target that I thought would help drive us both on the day - knowing that so many people have donated their hard-earned cash for you to run is a great incentive to keep moving. I'm very proud of us both to have raised the full target amount. At each Race for Life venue you can also donate unwanted goods at their Donation Stations, the proceeds also going to charity. Every stall at the event also contributes a portion of their profits to the charity as well. As we were running, Holly bought us both a special pink gerbera to celebrate our success! The event itself was well organised; easy to get in and out of, lots of space, plenty of toilets and a pretty park route. It was the perfect event for a race newbie because there was no pressure or expectation of time. You could choose to run, jog or walk the 5k route and everyone was so supportive. Lara and I have been very proud to be part of the Cancer Research UK Race for Life this year. #PinkArmy. If you fancy joining in with the Race For Life challenge yourself then I have a £2 discount code off the cost of entry to any 2015 Race for Life. Just quote RFLMel when entering the race online. if you do join up, please leave me a comment below to let me know when and where you will be running - it'd be great to give each other support.